The cucumber plant is a fleshy, bristly, creeping or climbing vine that attaches itself to objects by means of tendrils. The leaves are mostly long-petioled, cordate, and incised to make 5 points. The flowers are golden-yellow and bell-shaped. The fruit is well known to everyone. The word cucumber is used with other herbs: Wild cucumber or balsam apple (Echinocystis lobata); Indian cucumber (Medeola virginiana); Cucumber magnolia (Magnolia acuminata); none of which have anything to do with the garden variety of cucumber. Since ancient times, the juice of the cucumber has been used as a facial cleanser and as a treatment for skin irritations. Cleopatra herself was reputed to have used cucumber to preserve her beautiful skin. Chang Chien, the noted legate of the Han Dynasty, seems to have brought cucumber (Hu-kua) from Central Asia to China, as he did other useful plants. Cucumber juice is used in many skin products. Wild cucumber (Echinocystis spp. ); the seeds were roasted and eaten for kidney troubles by California Native Americans. When a cucumber is taken from the vine, cut it with a knife leaving about 1/8 of an inch of the cucumber on the stem, then slit the stem with a knife from its end to the vine, leaving a small portion of the cucumber on each division. On each separate split there will be a new cucumber formed as large as the first; thus, making the cucumber vines bear more crops. According to the old ways, this method of keeping cucumbers is given. For one barrel, use 3 lbs. of alum, 6 qt. of salt and water sufficient to cover them. Finely pulverize the alum and use coarse salt (solar salt, such as used for packing is best, as it contains no lime). Use only 1/4 the quantity to commence on as those put in first will take all the strength of the brine. Keep a weight on them and treat as ordinary salt pickles. Cucumber’s ability to eliminate water from the body makes it important for heart and kidney problems. Helps to dissolve uric acid accumulations such as kidney and bladder stones. Cucumber juice helps intestines, lungs, kidneys, and skin. For skin problems and for cosmetic purposes, rub the juice into the skin. Eaten as a vegetable, it is a good diuretic and can help prevent constipation. Apply it also to inflammations, bed sores, scalds and burns. Cucumber is used for cleansing the skin, bleaching (for freckles and discolored skin); also for sunburn, and rough skin. Cucumber slices or juice is applied to the face and/or hands, and left on 10-15 minutes, then rinsed off. Best for normal or oily skin. The most medicinally effective cucumbers are fully ripe, indicating a beginning yellow color. Juice: mix with apple, celery, or carrot juice to improve the taste. Take as required. Easily prepared in an electric vegetable juicer. For bags under the eyes; sometimes caused by water retention, sleep loss, etc. This remedy should be used daily until results are achieved. Grated cucumber may be applied to the area under the eyes for 15 minutes while lying down in a relaxed, comfortable position. This remedy imparts a sense of freshness, and excellent results have been reported. Peeled and grated potato can be used instead of the cucumber if desired. Lotion: 1/2 pt. juice of cucumber; 1 1/2 oz. deodorized alcohol; 3 1/4 oz. oil of Benne; 1 dram powdered Castile soap; 1 3/4 drams blanched almonds. Work the soap into cucumber juice, beat up almonds in a clean stone mortar and gradually work in cucumber liquid with soap. Strain through a clean muslin strainer, then return to mortar and while stirring gradually work in alcohol in which oil of Benne has been previously dissolved. Use in massaging the face and throat as it not only whitens the skin but also tones relaxed tissues. It may also be used to cleanse the skin. Juice lotion: cut cucumbers into small pieces, pound them into a paste, then extract the juice by straining through a jelly bag or strainer. Apply to the skin twice or three times a day. 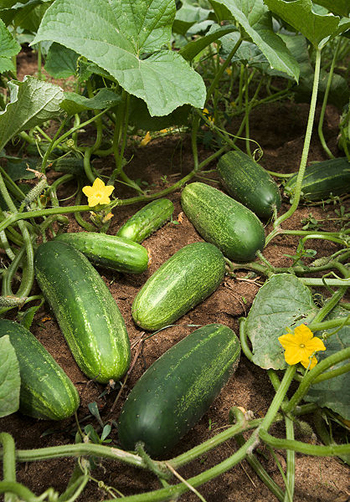 Cucumbers may also be used in the raw state by merely dicing them and rubbing the skin briskly with the diced parts. Complexion wash: a home-made cream for whitening the neck can be made from cucumbers. Cut one cucumber into 1/2 inch slices and place in a double boiler. Pour over the cucumber, 1 oz. almond oil. Allow this mixture to simmer for several hours. Pour off the liquid and measure it. To each oz. of the liquid add just under an oz. of lanolin and less than 1/2 oz. white wax. Warm this mixture together and stir thoroughly. Add some lavender essence before putting into jars. In the supermarket produce section.